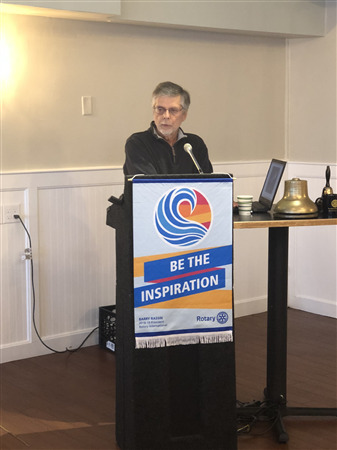 Our guest, Garry Kozak of GK Consulting spoke at our Rotary Luncheon on November 6th about the underwater maritime history off the local coast of MA & NH. GK Consulting specializes in undersea search and survey specifically for shipwrecks and aircraft. Garry was recommended to us by a board member of the Maritime Museum. His talk was fascinating! We learned about how he works to find a shipwreck, how he came to play key roles in the discovery of the USS Indianapolis and the Spanish Galleon San Jose! You can read more about it on their website. Thank you, Garry! Newburyport Rotary donates $6,500 to Local Charities. On Tuesday, December 12, the Newburyport Rotary held their annual holiday charity luncheon at Andiamo Restuarant. The Newburyport Rotary donated to the following charities: Boys & Girls Club of Lower Merrimack Valley, Newburyport Community Service, Firehouse Center for the Arts, Opportunity Works, Pettengill House, Link House and the Salvation Army. 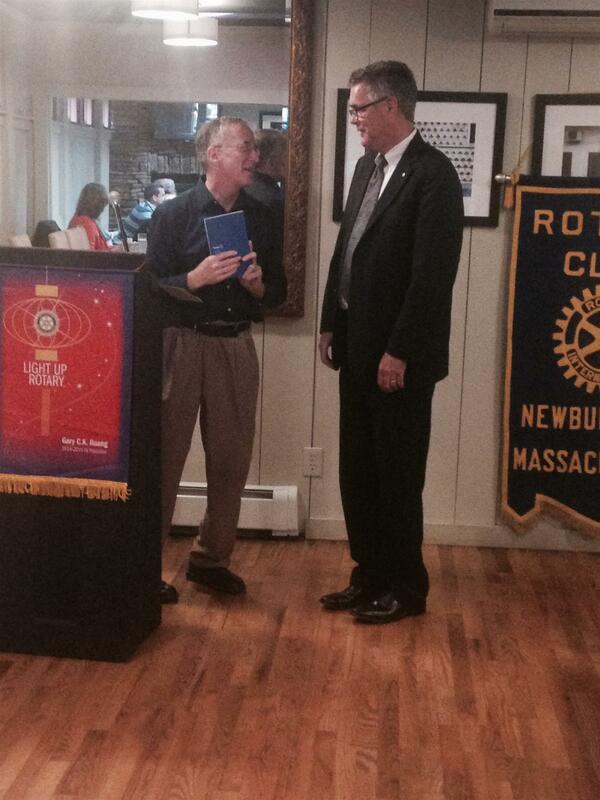 District Governor, Dave Gardner, made a joint visit to Newburyport and Amesbury Rotary Clubs on Thursday, September 28. Dave's lovely wife, Joan, accompanied him. We were also privileged to have Bob Wood, District Governor Elect, and Joan Arsenault, District Governor Nominee, attend. Shown in the picture are Joan Arsenault, Dianne Webster (Amesbury President), Marion Spark, Dave Gardner and Bob Wood (left to right). Lunch was held at Vasa Restaurant, Bridge Road, Salisbury. Dave showed slide shows of each club's activities and fundraisers which were fun to watch. Many members had Happy Dollars and they were given to Dave to donate to the Rotary Foundation. He also addressed Rotary's challenge of retaining and gaining members. He challenged each of us to invite three people to a meeting within the next quarter. Do you remember last winter? How could we forget it? We were buried in snow time after time after time. And did we still receive our mail on a regular basis? You bet we did! In order to thank Newburyport postal workers for their dedication and work ethic, The Rotary Club of Newburyport provided breakfast for more than 40 letter carriers and post office workers at the Post Office Annex in the industrial park. Port City Sandwich catered the event with a fabulous hot breakfast. Paul Bolas, USPS Postmaster of the Newburyport Post Office, reported that his crew were excited for the breakfast and grateful to be appreciated for their work. Serving the breakfast were club President Deborah Andrews and club members Ann Ormond, Cindy Johnson, Louis Rubenfeld, Geri Dorr, Peter Doyle, Tom Howard, and Nikki Misenheimer. The mission of Rotary International is to provide service to others, promote integrity, and advance world understanding, goodwill, and peace through its fellowship of business, professional, and community leaders. Motto: Doing Good in the World. For more information about the Rotary Club of Newburyport, please call Deborah Andrews at 978-270-2623. Liz Cullen presented Past President Nick Chapman with his Paul Harris Fellow. He is now a Paul Harris Fellow +. Last Tuesday, we welcomed Chris Gagnon from the Jeanne Geiger Crisis Center! 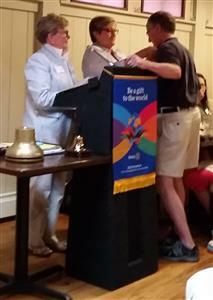 Rotary Club of Newburyport's President, Deborah Andrews presents the inductee with his Rotary member pin. He joins other new members Stephen Royer (Avita); Peter Doyle (Edward Jones); Kymberly Codair (Atria); Deborah Yameen (TD Bank); and Lyndi Lanphear (3 Cherry Street). Recently the Newburyport Rotary Club distributed 240 dictionaries to third graders at the Bresnahan and River Valley Charter Schools. 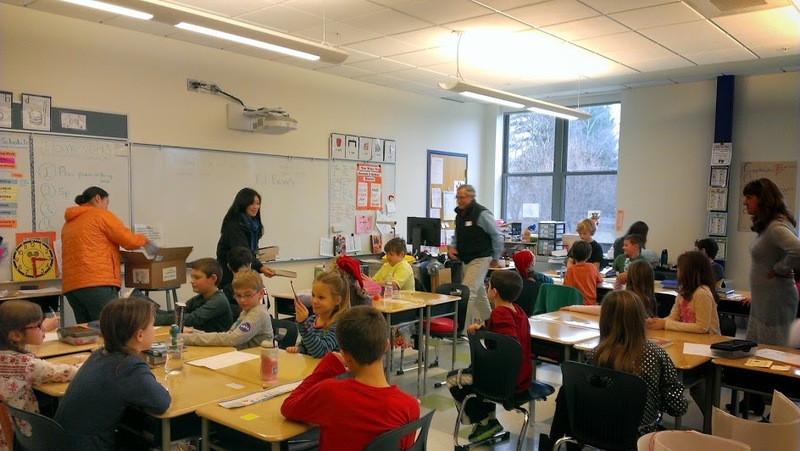 Here are NBPT Rotarians Nikki Misenheimer, Jennifer Hwang and Ken Smith distributing dictionaries to one of the 3rd grade classrooms at the Bresnahan School. Rotarian Susan Christ delivers this year's dictionaries to the third graders at the River Valley Charter School in Newburyport. Newsletter for the Rotary Club of Newburyport's meeting on August 12, 2014. Newburyport Education Foundation (NEF) announced a generous gift from the Newburyport Rotary Club will be recognized with the naming of the Literacy Specialist Room-B244 in the new Francis T. Bresnahan Elementary School. A naming ceremony to be held in the fall with the school’s opening and will recognize this gift and others as part of the NEF’s donor recognition campaign currently underway. Through the NEF’s donor recognition program, “Make Your Mark,” rooms at the new school can be named to recognize and honor an individual or organization and the donation supports the NEF’s mission to enhance education in the Newburyport Public Schools. Rotary chose the NEF as the recipient of their major donation this year as the NEF is “near and dear to the heart” of current Rotary president Cindy Johnson, said Sue Thomas, Rotary spokesperson. Each year, Rotary makes a donation to a local organization with the funds raised from its annual Chef’s Table Dinner. Geri Dorr chaired the event this year and it is a collaboration of many of our club members and one of our major fundraisers. For the past few years the entire profit has been donated to one recipient. In the past donations were made to AJH and the Newburyport Public Library. Club Secretary Nikki Misenheimer and Past President Ann Ormond accept the 2014 Service Club Bell Ringer award from Salvation Army Officer and fellow Rotarian, Jeff Brunelle. 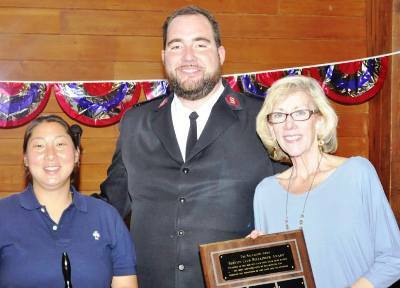 The award was presented at the Salvation Army annual Volunteer Dinner held on Wednesday, June 18, 2014. This is the third year in a row that the Newburyport Rotary Club has been recognized for collecting the most donations during the Christmas Bell Ringing season. Congrats to all Rotarians who "stood the kettles" on cold winter days. Fellow Rotarian and Salvation Army officer, Lt. Jeff Brunelle was presented a Paul Harris Fellowship from the Newburyport Rotary Club at our club's regular lunch meeting on Tuesday, June 10, 2014. Jeff exemplifies "Service Above Self" in his participation in Rotary events and his service to the community through the works of the Salvation Army of Greater Newburyport.. Jeff and his wife, Meghan, have been the officers in charge of the Salvation Army Corp in Newburyport for the past three years and have accomplished many projects and programs. These including the recent completion of brand new handicapped bathrooms and the installation of a generator to supply power for the emergency shelter. Our congratulations to Jeff for this well deserved award and honor. Invocation: Jeff delivered a heartfelt invocation thankful for Cindy’s leadership over the past year and Rotary’s ability to continue to serve the community ever better. Guest Speaker: Cindy, our out-going President will make some summary remarks. HAPPY DOLLARS: Max expressing his satisfaction that Andiamo let him have a second plate for lunch for the first time! Grace for her para-legal having a beautiful baby girl and for Cindy’s capable leadership over the past, most wonderful, year. Ann for acknowledging what a lovely man David Murison was and how he will be missed. Chris said he had 20 Happy Dollars for a successful baseball season, the naming of the auditorium at the Bresnahan School and for the outstanding leadership that Cindy provided over the past year! Vicky praised Cindy’s leadership and in her inimitable style lauded her asserting, ‘it’s all about the jokes!’ Deb for praising Cindy for the excellent leadership that she provided during a year that seemed to go by so fast and for working with Vicky during the year. Walt for raising $650.00 in his fundraiser. Jeff for Cindy and the leadership she provided over the past year; for Nick and the leadership he will provide during the upcoming year and for Rotary winning the trophy again for Ringing the Bell! Rotary garnered $8,400.00 to lead all of the other service organizations in the city and has won three of the four sides on the trophy! BIRTHDAYS/ANNIVERSARIES: Nick Chapman 6-11; Walt for his Anniversary on the 21st. Tom Howard and Norm Jutras have birthdays upcoming. Cindy indicated that Russ and Sheila were absent because Sheila’s sister had just passed away. No other information was available. Cindy presented Casey Ross with her Norman H. Russel Scholarship for academic excellence. Meet Foundation giving goals, increase giving to Rotary International and become a first class giving club. She related that all of these goals were accomplished. There were four new Paul Harris Fellows in addition to many former Paul Harris Fellows who achieved the goal once again. The average amount per member for giving to RI had increased distinguishing Newburyport Rotary and she was proud of that accomplishment. Membership had increased more than any other club in the district. Andiamo has become the new luncheon home for Rotary and has provided the membership with the most delicious meals. The enthusiasm and energy of the club is palpable. Cindy thanked all the members of the Board and the people who worked with her to make the year such a success. She ended her comments with one last joke! Bartender says, “NO,” and tells the duck to get out. if he has any grapes. Bartender says NO and tells the duck to GET OUT! But the duck keeps coming in. He’s going to nail his beak to the bar! Deb also told a joke in honor of Cindy’s last day. Seems that Sherlock Holmes and Doctor Watson went camping together. and tell him what he sees. “And what does that mean?” Sherlock asks. and the possibility that life exists in other parts of the universe…. Nick Chapman, the President elect, came to the podium. He banged the gavel on the bell and put the transition into effect. Raffle: Louis indicated that the raffle amount was $305.00 with 50 cards left in the pack. Cindy pulled the winning ticket, #209989 held by none other than, Bob Keiver! He pulled the 9 of Spades, however, so the amount will continue to build. Lunch Choices: Seafood Rigatoni Pan Roasted Swordfish, Salmon, Monk Fish and Scallops, Tomato Basil Broth; Antipasti Sampler Meatballs, Tomato Fresh Mozzarella Crostini, Balsamic Greens, Proscuitto and Fontina Cheese. HAPPY DOLLARS: Vicky in celebration of the sun deciding to shine, winning money at the Chamber Pot event and for becoming Pete Kelly, which she said, "doesn't take much at all". Walt for raising money for a very worthy organization ; Sue for changing her name back to Thomas which she has wanted to do for a very long time. Welcome, SUE THOMAS! ; Jim Kelcourse for throwing his hat into the ring to run for State Representative; and Geri for reminding everyone about the Chef's Dinner coming up on April 29th and the need to get both red and white bottles of wine to her. MEETING/ANNOUNCEMENTS: Cindy began the meeting with a short story about Mother Theresa. Apparently, when she arrived in Heaven she was greeted by God who welcomed her and asked if she was hungry. God then breaks out some tuna and bread. As Mother Theresa looks around she sees that everyone down in Hell is eating Filet Mignon. Puzzled, she asks God "How come?"  God says, "It's just the two of us, so who wants to cook!" Cindy reminded everyone that the Chef's Dinner is coming up on April 29 th; that the District conference will be held on May 2 and the Coast Guard Dinner in will be held May 20th. 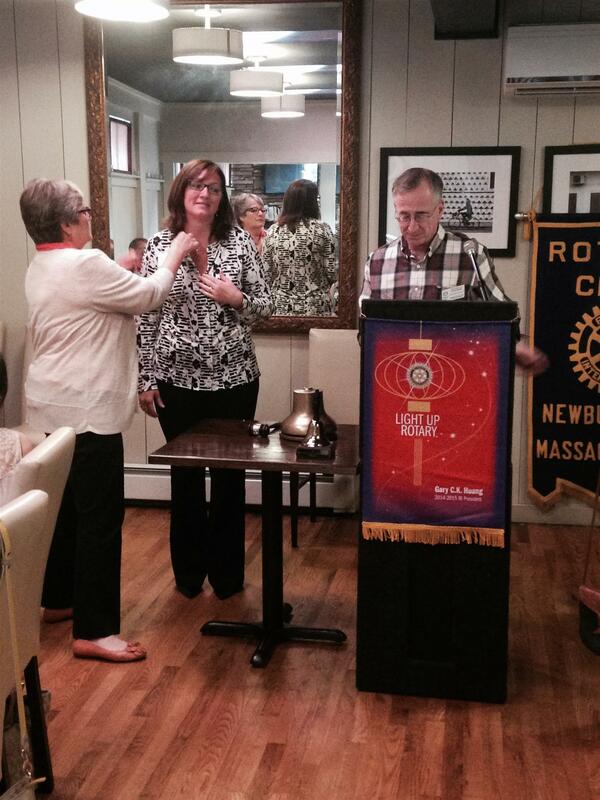 Angela Barnes, a Podiatrist in Newburyport, was inducted into Rotary. By a voice vote the slate was adopted. Raffle: Marshal Tom Howard performed the duties of the Sargeant-At-Arms in Louis' absence. He indicated that the raffle total had reached $2,906.00 with four cards left. The winning ticked # selected was #240810 held by Deborah. She pulled the two of hearts so the total will continue to grow for next week with only three cards left to choose from!!! !